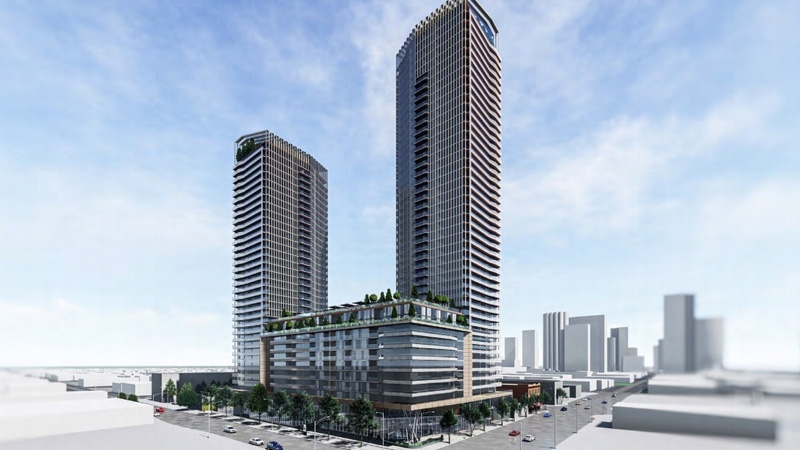 The City of Edmonton has received a rezoning application to build two residential towers on Jasper Avenue. The towers, approximately 35 and 45 storeys tall with a maximum of 1,050 units, would be located at the northeast corner of Jasper Avenue and 108 Street. The project includes retail at street level, underground parking and a new public entrance to Corona LRT Station inside one of the two towers. A number of residential and commercial buildings would have to make way for the towers to go up, including El Mirador, Queen Donair and the nightclub Anthem. With the upcoming Jasper Avenue redesign, expanding transit and existing bike network, the city is aiming to make the downtown core a more attractive place to live. “An active and vibrant downtown is the showcase of the city, so it’s a very good goal to have,” City of Edmonton Senior Planner Travis Pawlyk told CTV News. Edmontonians are invited to learn more about the proposed project and offer their feedback at the First Presbyterian Church on Feb. 20 between 4 and 6 p.m. The two towers, proposed for Jasper Avenue and 108 Street, would have approximately 35 and 45 storeys and a maximum of 1,050 units.